Recently in consultation with our Advisory Board we changed how we select astro-ph articles from arXiv, to optimize collection of the content our community needs. Since then we have been analysing the results of the new selection process and listening to your feedback. As a result, we are making an important adjustment to the selection policy to better suit your needs. As of the past Friday, we are again harvesting 100% of astro-ph.CO content. This eliminates the possibility of missing relevant papers. We will soon fill in any cosmology content that was not added to INSPIRE in the past few weeks. We are working to provide the most accurate and comprehensive citation data, so no articles and citations are lost. All pre-prints which are cross-listed to astro-ph.HE and astro-ph.CO, as well as astro-ph preprints from other sub-categories which are cross-listed to any of the core INSPIRE categories. As always the case, articles relevant to HEP will be added on a case-by-case basis. Astro-ph authors should also be aware that because INSPIRE’s focus is HEP, our automated tools are slightly less effective at correctly attributing astro-ph articles to their authors, and extracting all the references. Consequently, we would like to call on astro-ph authors to ‘claim’ these articles in their profiles (check here) and submit corrections via the reference correction form if any references need improvement. As always, we will keep an eye on the results, and make sure we are making optimal use of our resources to provide the best service possible for our user community. We apologize for any confusion or concern during the pilot phase and we are most grateful to the community in supporting the way we adjust our services. We are eager to receive your feedback as we work together to make INSPIRE always better. The Astronomy, Astrophysics and HEP communities have long relied on arXiv, ADS and INSPIRE for their communication. ADS has been tailored to the needs of the Astronomy and Astrophysics communities, and INSPIRE emerges from the HEP community. All three communities use arXiv to distribute preprints. 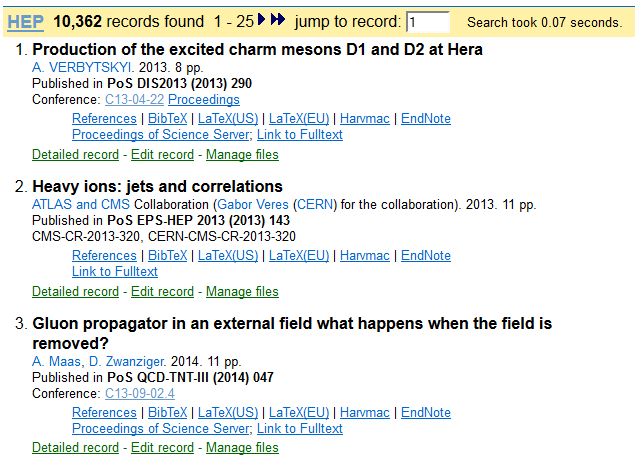 INSPIRE currently lists all astro-ph preprints appearing in arXiv. However, most of them are not immediately relevant to the HEP community and we do not provide additional services such as author disambiguation, affiliations, reference curation, conference information, etc. for these preprints. For the rest of astro-ph, as for all other arXiv subcategories outside the CORE categories (see http://inspirehep.net/info/hep/collection-policy), we will take eprints cross-listed to the CORE categories. We will also take care to cover articles on dark matter and dark energy, as well as articles by the Planck Collaboration. Other articles relevant to HEP will be added on a case-by-case basis. For example, in the astro-ph.CO category [Cosmology and Extragalactic Astrophysics], roughly 50% of the publications are HEP-related and will be added to INSPIRE. We hope this will make it easier for users to find relevant content. Our friends at ADS will continue to be the natural port of call for those users who need a deeper analysis of Astronomy and Astrophysics content, and we are working behind the scenes to better integrate the services of our two systems. A sleeping beauty is a paper that slumbers for an extended period of time, attracting few if any citations, until suddenly it awakens and begins to attract many citations. 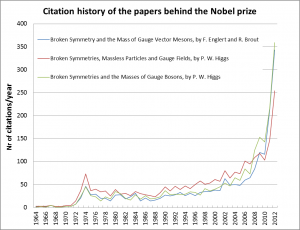 Such a paper is Peter Minkowski’s Physics Letters B article that studied the possibility of lepton family number violation. 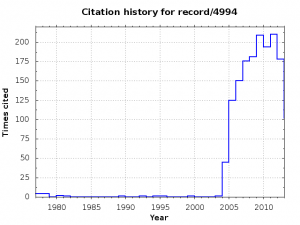 From its appearance in 1977 until 2003, 26 years later, it received only 17 citations, then it woke in 2004 garnering 46 citations, followed by over 100 in 2005 and amazingly has enjoyed increasing numbers of citations in virtually every year since. Further information on the citations of Minkowski’s paper can be found at its INSPIRE citation page. Who knows how many other papers in INSPIRE are similarly biding their time? 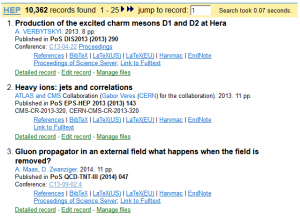 Check your references before you submit to arXiv! Creating your reference list with the help of our LaTeX and BibTeX output formats increases the likelihood that references are extracted and linked correctly. If this fails, we most likely don’t have the paper you’re citing in our database. You might then want to suggest us to add it to INSPIRE if the paper is of immediate relevance to HEP. The tool also works for papers you have already submitted to arXiv if you just provide us with the arXiv identifier. We are constantly working on improving refextract and it should also recognise theses or selected conference series in the future. If you have more suggestions for useful tools we could provide, don’t hesitate to let us know at feedback@inspirehep.net. 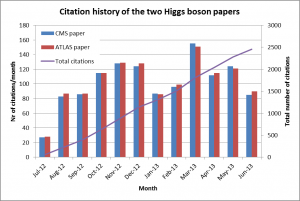 As with astrophysics, the connection between nuclear physics and high energy physics has recently been growing closer, an example of which is the string theory implications of heavy ion collision experiments. 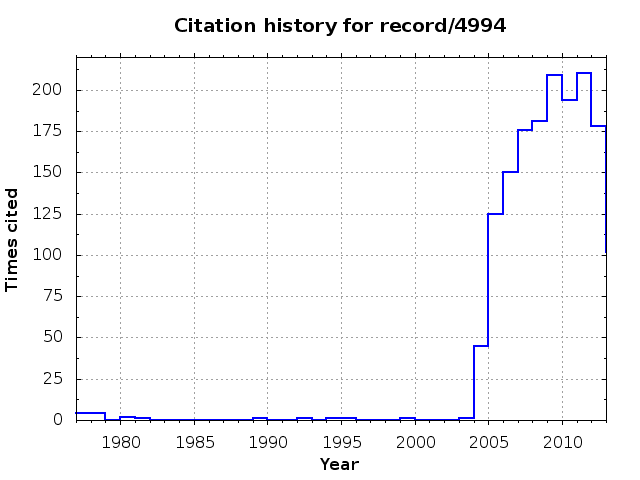 The annual topcite list for 2011 contains two nucl-ex papers and in the lifetime of arXiv, over 200 nucl-ex eprints have been cited by hep-th eprints and 100 hep-th eprints have been cited by nucl-ex eprints. 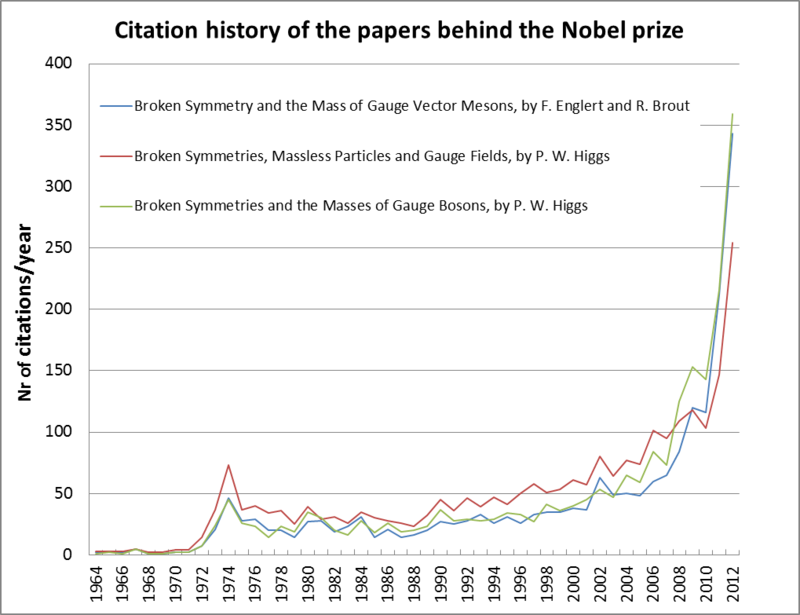 Although INSPIRE has long provided coverage of nuclear physics, for example by including the nucl-ex and nucl-th eprints as well as everything published in Physical Review C and Physics Letters B, we can now expand this service in order to provide the HEP community with a fuller picture of research at the borders of our core interest. Starting in 2013, we are now including complete coverage of all articles in journals relevant to the intersection of HEP and nuclear physics: European Physical Journal A, International Journal of Modern Physics E, Journal of Physics G and Nuclear Physics A. While we will continue focusing our resources on the curation of HEP articles we will periodically curate the titles and author lists of these new additions.